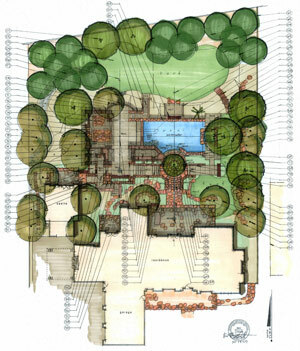 Livingston Associates Landscape Architecture and Planning is a landscape architectural design company serving Southern California including San Diego, La Jolla, Rancho Santa Fe, Encinitas, Coronado, Del Mar, Poway, Riverside, Irvine and within southern Arizona including Yuma, Tucson and Phoenix. Livingston Associates offers landscape design services from the initial conception of a project through the construction process and onto maintenance of a maturing project. This on-site consultation is a service for clients who wish to gain landscape design options or discuss specific landscape problems on an hourly basis. This scaled landscape plan, is a schematic overview of the site, highlighting existing and proposed designed landscape features derived from information gathered from the client and a site analysis survey. Livingston Associates can provide assistance to the client in selecting a contractor bidding on the landscape drawings and receive / approve submittals of products to be used on the project. Livingston Associates can provide clients ongoing landscape maintenance specifications, requirements and suggestions after installation as the project matures.